PREMIUM CAB COMFORT: The Polaris® Lock&Ride® Pro Fit cab design allows you to battle it all in comfort and keep the elements out. Whether you’re on the trail or getting some work done, our premium cab component accessories provide you with class leading comfort. Plus, with Lock & Ride® technology you can tailor your cab system to your needs in seconds. Shop our Polaris GENERAL accessories now. CUSTOMIZABLE VERSATILITY: Whether you’re tackling the toughest trails or battling the harshest conditions, Polaris Engineered™ Accessories provide you with the most critical protection accessories you will need for the Polaris GENERAL™. 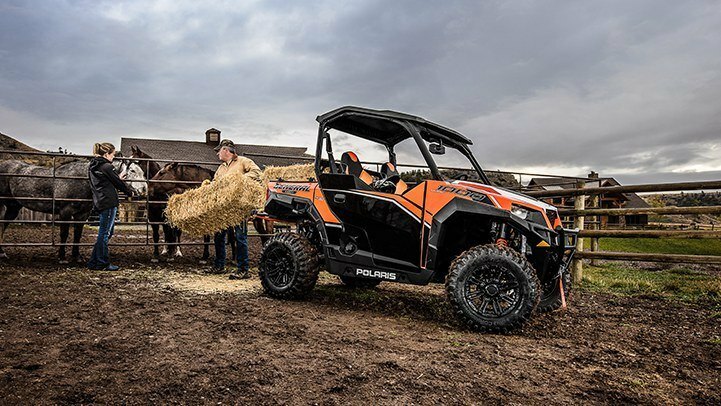 From bumpers to A-arm guards and roofs to rock sliders, Polaris has engineered these accessories to keep your machine protected from whatever you encounter. With our Expanded Anchor Mount and Polaris® Lock&Ride® technologies, you can add components quickly without damage to your frame, all in less than 5 minutes. Find the right accessories for your needs now. DUMPING CARGO BED: Get the job done right and bring enough gear for your adventure with the capacity to carry 600 lbs. in the deep cargo bed. 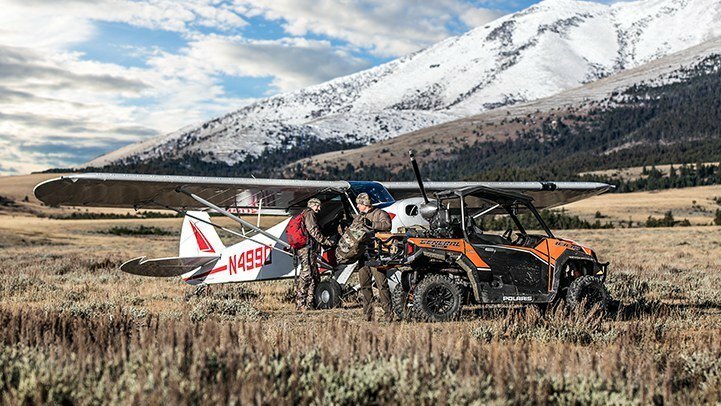 Polaris GENERAL features convenient one latch tailgate opening on the dumping cargo bed as well as Lock&Ride® integration for a variety of specially made accessories to get work done faster and get back to riding. INTEGRATED HALF DOORS: Stay protected from weather and trail debris with standard half doors. They're built with automotive style latches and great sealing to perform as flawlessly as the rest of the machine. They also swing open wide to make it easy to get in and out of Polaris GENERAL all day. HIGH PERFORMANCE WHEELS AND TIRES: 14" Matte black cast aluminum wheels for a high performance look and are paired with standard 27" GBC Dirt Commander 8-ply tires. They offer excellent side bite, stiffer sidewalls, better tracking through corners and increased durability for roots and rocks. 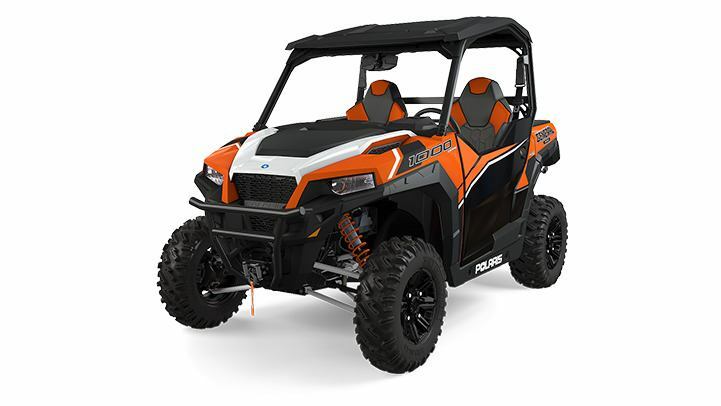 STANDARD FEATURES: The Polaris GENERAL Velocity Blue comes standard with a Polaris HD 4500 lb. winch and front bumper to help you dominate the trail and take on the work when you get home. ALL-NEW COCKPIT: The Polaris GENERAL's all-new cockpit was designed for the ultimate balance of work and play attitude. From the redesigned premium bucket seats that lock you in off-road, to the customizable instrumentation and easy cab access, the Polaris GENERAL is the new standard in all-day comfort. 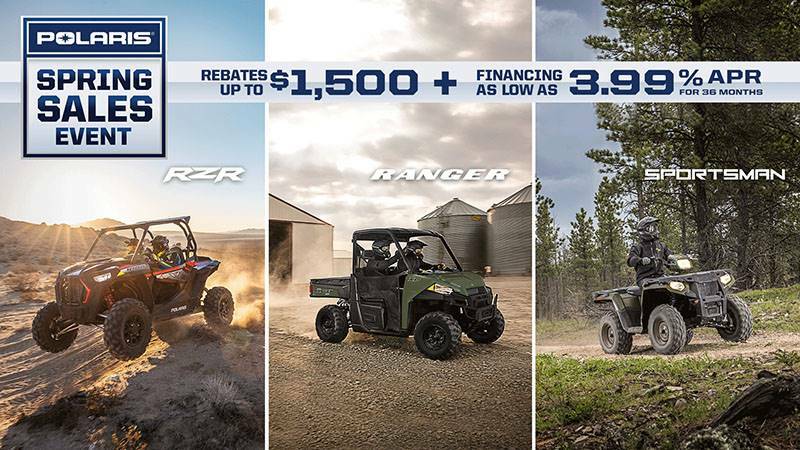 SECURE, COMFORTABLE BUCKET SEATS: Polaris GENERAL comes with all-new seats designed to keep you comfortable no matter where the ride takes you, from ripping trails to a day cutting wood. A wide seat base and supportive bolstering gives a secure cockpit to driver and rider and with standard cut and sewn seats. Driver seat comes standard with a seat slider to dial in operator ergonomics. 23L OF INTEGRATED STORAGE: Keep work and play essentials close at hand with a combination of in-dash storage and a class-best center console featuring a 12V outlet and 5.8L storage. BRAND NEW CUSTOMIZABLE INSTRUMENTATION: The all-new digital instrumentation cluster moves with the tilt adjustable steering wheel for maximum visibility. The combination of digital and analog gauge indicates vehicle speed, engine RPMs and standard trip information. The center digital gauge can be set up to just the way you want it, and even features an auto adjusting backlight that can switch from red to blue. THE MOST POWER IN ITS CLASS: Pumping out 100 horsepower The Polaris GENERAL is the most powerful Rec Utility ever produced. 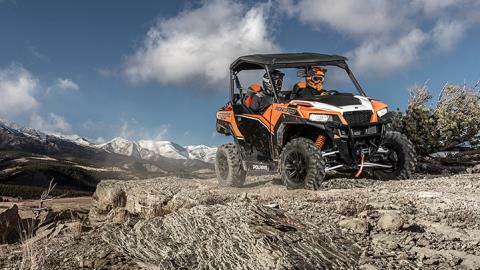 The Polaris GENERAL has a class best 0-40 mph … 18% more horsepower than Commander so you can light up the trails. TORQUE FOR THE TOUGHEST JOBS: This off-road oriented 999 cc twin delivers broad max torque throughout its rpm range - 65 ft. lbs. of torque to haul, pull, and power through the biggest jobs. 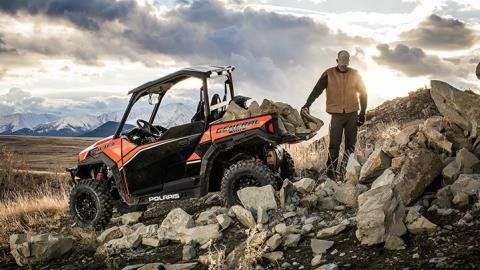 CAPACITY TO DOMINATE: Loaded down with gear for an extreme camping trip or ready to handle the toughest jobs, The Polaris GENERAL's 1,100 lbs. total payload is up to the task. With the standard 2" receiver, The Polaris GENERAL's 1,500 lbs. towing capacity - aided with standard engine braking - is ready to tackle whatever your day demands. 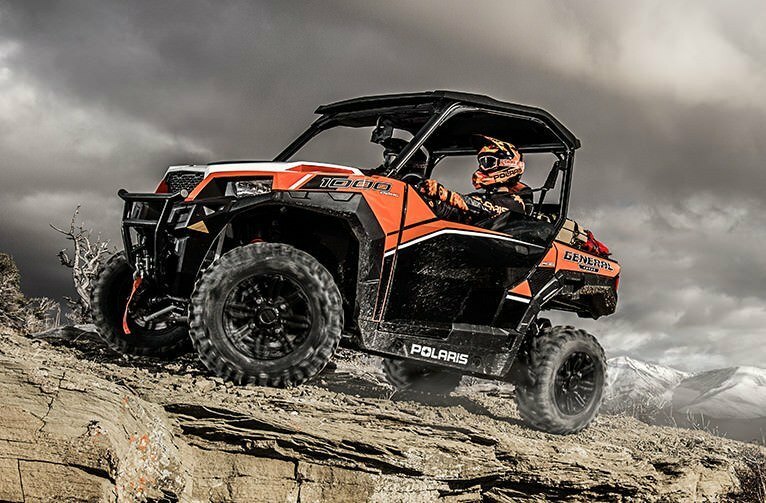 HIGH-PERFORMANCE CLOSE RATIO AWD: With the industry's fastest engaging high-performance AWD, The Polaris GENERAL is ready to attack demanding trails and the harshest fields. All four wheels engage near instantly when your vehicle needs more forward traction and reverts back to 2WD when it doesn’t, no need to wait for pressure to build up or to stop and lock in a diff like our competitors. SUSPENSION FOR WORK AND PLAY: You get it ALL with The Polaris GENERAL. With sway bars front and rear, it stays planted and composed on the trail. The tuned suspension geometry featuring dual rate springs maintains 62% of its ground clearance when fully loaded down -- 1.3 inches higher than Commander. BEST IN CLASS TRAVEL AND GROUND CLEARANCE: No other machine gives you the suspension travel and 12 inches of ground clearance advantage like The Polaris GENERAL. 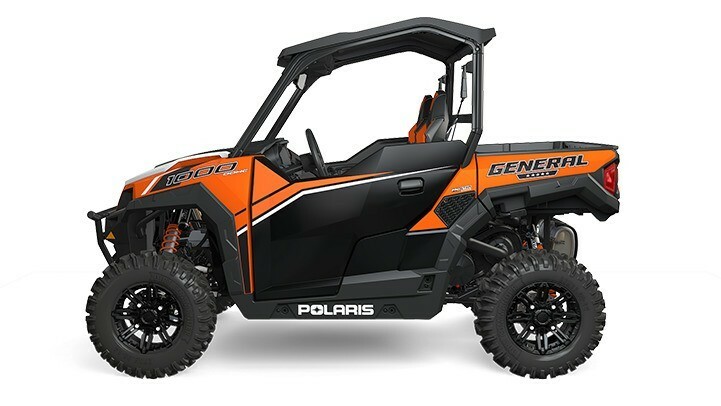 With 12.25" of front and 13.2" of rear suspension travel, The Polaris GENERAL is ready to clear whatever the trail or work site throws at it.